Your annual giving plays a major part in the success of Southern College of Optometry and The Eye Center. Whether you support student scholarships, patient care services or our effort to improve our academic and clinical facilities, your generosity enables us to succeed. Your support is critical in shaping the positive outcome of all that we accomplish. 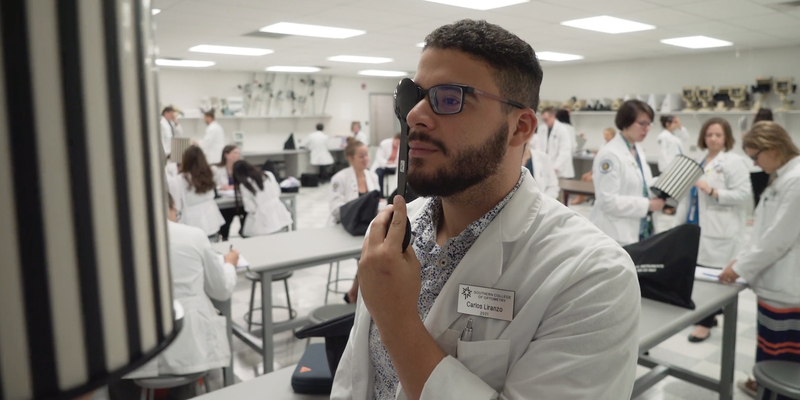 Your support means the difference between SCO offering a good optometry program and SCO being a great school of optometry. We believe this success is evident in our alumni, from those who lead our professional organizations at all levels, to recent graduates who return to practice in communities across America using the professional training and expertise they received at SCO. When our graduates successfully transition into the profession of optometry, it’s a positive reflection on their alma mater. Are you willing to give to SCO now? We are grateful for your support and openness to contribute to our program’s growth and success. Your generous support can be strategic and personally meaningful through planned giving. You can honor a loved one or provide non-cash gifts, structuring gifts that maximise your contribution. SCO alumni are the biggest advocates for and supporters of the program. Our 200 Strong initiative seeks alumni that are willing to be leaders in contributing to the financial growth of the program. If you’d like to honor or recognize a loved one with a dedicated spot on the SCO campus, a tribute gift could be the perfect resolution. We have opportunities across campus to permanently ingrain your loved one’s legacy at a place he or she loved. Our donors impact our current students and programs in more ways than you can imagine. If you’d like to learn about ways your donations can impact our program, read our testimonials from current students and alumni. As an educator of nearly half of SCO’s graduates, Dr. Jim Newman left a wide-spanning mark on many of our alumni. Our hope is to name the new theory and methods lab in his namesake, and your donation will help. Southern College of Optometry will work with you to provide you with giving opportunities that best meet your desire to support the college. Call or email SCO’s Office of Institutional Advancement to make other arrangements for gifts, including information about endowing scholarships, estate planning, charitable bequests and other giving options. Your support is essential to improve access to the unique expertise that SCO and its Eye Center has to offer our students, our patients and our outreach to people in Memphis and around the world. Your generous tax-deductible gift provides resources to fund initiatives that make SCO competitive in optometric education. Your dedication to improving the eye health and vision of patients and supporting higher education demonstrates our shared commitment to our profession. If you would prefer to make a recurring gift via credit card, please contact the SCO Office of Institutional Advancement at (901) 722-3216 or (800) 238-0180 ext. 4. SCO's privacy statement demonstrates our firm commitment to privacy.